Not everyone can go into space but with a tank of hydrogen and a bit of knowledge about circuit boards, a balloon could be the next best thing. That's what high-altitude ballooner Bruce Coates has been doing for seven years. Coates, a unit support specialist in Information and Communication Technology (ICT), is a member of the Saskatoon Amateur Radio Club (SARC), a local society for ham radio operators and hobbyists. Over coffee with another member in 2007, they decided the try launching a high-altitude balloon (nicknamed SABRE) and tracking it using ham radio technology. "What ham radio has let us do is be able to track it and have more fun with it than you might without," he explained. "Without ham radio, we could still fly balloons, but people would use things like cell phones which don't work past a certain altitude and don't work outside of the range of a cell tower." Since the maiden voyage in 2008, SARC has launched 21 balloons in the province. From take off to crash down, a typical SABRE flight is just under three hours, but they get some serious air: the highest the balloon has ever flown was just over 110,000 feet, "which is three and a half times higher than a jetliner, or four times as high as Everest, or a tenth of the way to the space station, however you want to look at it," laughed Coates. The balloon is made of latex, is about two metres across and stretches substantially once filled with hydrogen (less expensive than helium, said Coates). Dangling precariously from the balloon is a bright, neon parachute and a payload box carrying tracking gear, GPS equipment, and still and video cameras to capture the journey. But launching a balloon is not quite as simple as the movie Up makes it out to be. Before the balloon leaves the ground, the flight has to be co-ordinated through, and approved by, Transport Canada and Navigation Canada. "We're taking this balloon and launching it up into the air, and we have to worry about air traffic at that time," said Coates. "If something ever hit it, it would be exceptionally bad." The balloon, which cannot be steered, is treated as an aircraft flight and monitored by air traffic control, he explained. The onboard GPS updates every 30 seconds, so the balloon is also tracked on the SARC website. Once up, up and away, the balloon rises above the ozone layer to the upper fringes of the atmosphere, a place called near space, where pressure is sorely lacking. "By the time it gets up there, it's almost a vacuum," said Coates. "Sooner or later, the pressure is just too much and the balloon breaks." At that altitude, there is more than just pressure to worry about, though. The brutal weather conditions—as low as -60°C—and intense ultraviolet light pose a threat to the safety of the payload. And how does an amateur balloonist protect the payload from extreme cold and harsh ultraviolet rays? "In a word, Styrofoam," said Coates. The box is cased in a layer of Styrofoam one inch thick, enough to insulate from the environmental stressors. The Styrofoam also serves as crash-safety gear when the payload comes hurling back to Earth. "Our standard for equipment is, you should be able to take your payload and drop it from about table height or so onto cement and have it survive." 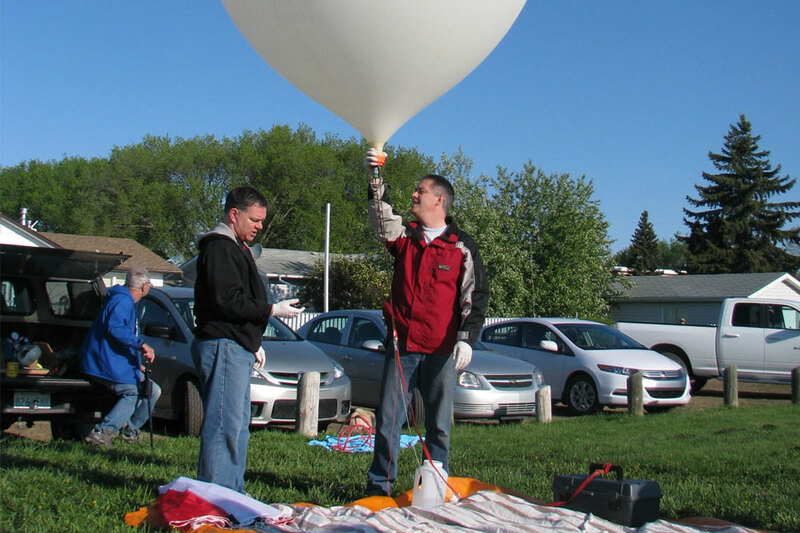 In addition to the GPS trackers, the group uses data from the American National Weather Service that measures wind to predict where the balloon will not only fly, but land as well. The payload has ended up in some interesting locations, including forests, sloughs and even on a power line, which SaskPower had to remove for them. One landed "about four kilometres past the end of the last road north of Prince Albert, so we had to walk through the bush and swamp to get it. Once it lands, it's like the world's biggest geocache," said Coates. "We know where it is, we just have to go find it."